We now refer to our Doggie Latchkey sitters as Uncle Marc and Aunt Kat. After relocating from another state for a very demanding job Doggie Latchkey came to the rescue with Marc and Kat. They have gone beyond the call of standard duty for our furry children. Our dogs Jake and Sammi love them so much! They even took Sammi to doggie emergency when she got into things she should not have before the sitter arrived. To say that “Uncle Marc and Aunt Kat” give us comfort when we have to be gone is an understatement. Thank you Doggie Latchkey!!! 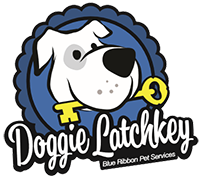 We’ve been using Doggie Latchkey for several years, every day. Our dog is our only child and we take his care very seriously. DLK is top notch! Denise is very detail oriented and everything runs like clockwork. We love her employees and trust them implicitly. Highly recommend!!!!!!! Best Pet Service I Have Used! Denise and her staff have been the best pet service I have used in the last 15 years and I’ve used three. Molly absolutely loves them and is always happy and worn out (a good thing for a pit bull) when I get home. I don’t know what I would do without her considering my work and performance schedule! They have been a life saver, especially when I have last minute needs! We now refer to our Doggie Latchkey sitters as Uncle Marc and Aunt Kat. Contact us to schedule a meet and greet!